As we approach the one year anniversary of the introduction of our Palomino Blackwing pencil we are nearing the next step in the evolution of the Palomino and Blackwing product ranges as we get set to introduce our first series of journals, sketchbooks and notebooks. 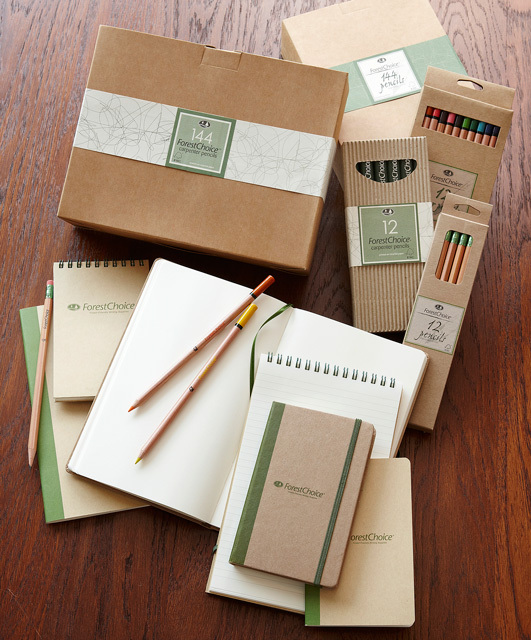 In addition, we’ll also be complementing our ForestChoice FSC certified pencil range with a selection of FSC Certified notebooks. So, here is a first look at the overall range, though we are planning feature posts on individual product group selections leading up to our official launch near the end of September. When we first conceived the idea to introduce a range of notebooks in some of our top brands, we had several goals in mind. First, the design and quality had to be fully consistent with the high standards for each of our relevant pencil brands: Palomino, Blackwing and ForestChoice. This meant using superior materials, as well as partnering up with an experienced and reliable supplier with all the capabilities to produce outstanding products on a competitive basis. We wanted a collaborative partner to guide u s in understanding and learning about the notebook market, but that was creative and adaptive to our concepts and needs as well. After several months of research, we found just what we were looking for in Istanbul, Turkey. As it turns out Istanbul has a long tradition of artisanal printing and bookbinding. Our new partner, Talat Printing & Leather Products Company, has over 50 years of industry experience and is now into its third generation as a privately held family business. Thought primarily a producer of premium customized planners and notebooks for large commercial clients, they introduced their own Fabio Ricci brand range for retail distribution in the past few years. As part of our partnership we will also be taking on the North America distribution of the Fabio Ricci brand, initially introducing their Elios line of their notebooks this fall, along with our own California Republic family range to retailers and distributors. 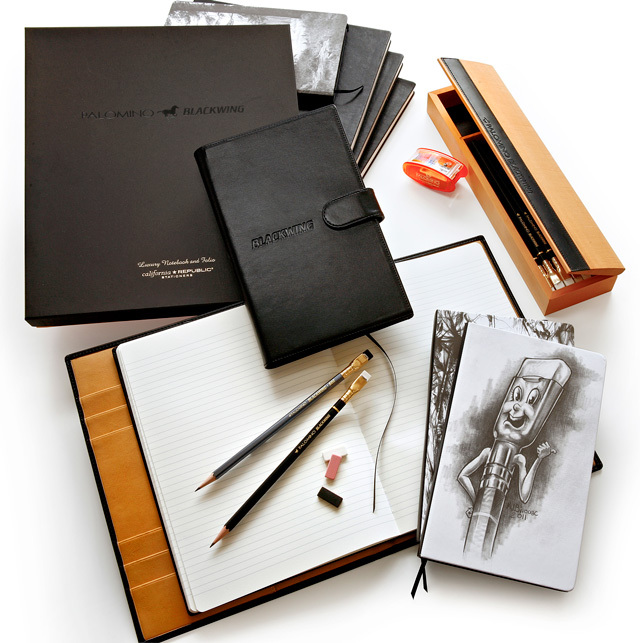 Our next goal was that our notebooks needed to have a functional partnership with our pencils and a design that supported your creativity, whatever the specific activity: writing, drawing, sketching, composing and more. For this, I spent 4 days in Istanbul in early April working with Talat to develop our initial product range with adaptations of Talat’s items. All the materials utilize premium acid free papers and covering materials from European suppliers in Spain or Italy with appropriate weights for each notebooks intended purpose. ForestChoice products include FSC paper as well as cover stock. This was supplemented with work from our branding design team to come up with a belly band and packaging design theme that was informative and helpful. In all, we’ve got a great line up we are very proud of as an initial launch and we received very positive feedback when we showed the samples to potential customers at the National Stationery Show back in May. Getting everything done in time for the NSS was a challenge, but we were very encouraged by the feedback received. Production of our initial stock has been completed and the shipment is currently on the water expected to arrive in California within the next two weeks. In the coming weeks leading up to the launch we’ll cover each of the products in more detail. 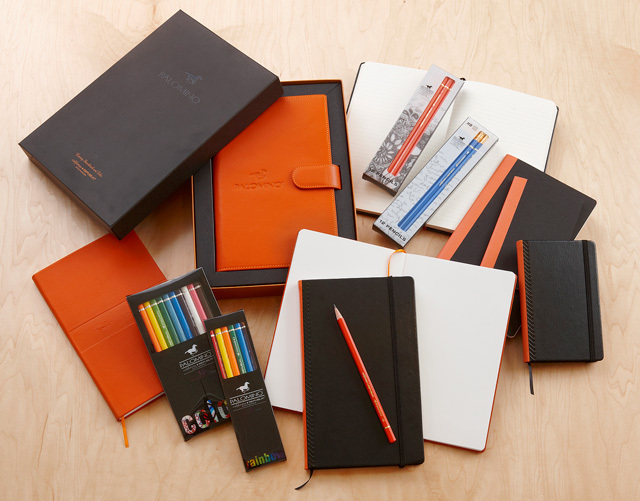 We’re very excited about this next step in our evolution as a broader range supplier of premium writing pencils and notebooks that support a creative and enjoyable experience of putting your ideas to paper and pencil. It’s not just a pencil and a notebook. It’s an experience. My wife and I recently completed a driving vacation down the California coast which included an overnight stop in San Simeon where we visited Hearst Castle. Each of us had been there separately as children, but clearly our appreciation of this architectural gem and the vision of William Randolph Hearst is much greater with a bit of seasoning over the years. Having designed, built and remodeled a couple very modest houses ourselves, we found it amazing to see what Hearst and his Architect Julia Morgan accomplished over 28 years that they collaborated on this property. 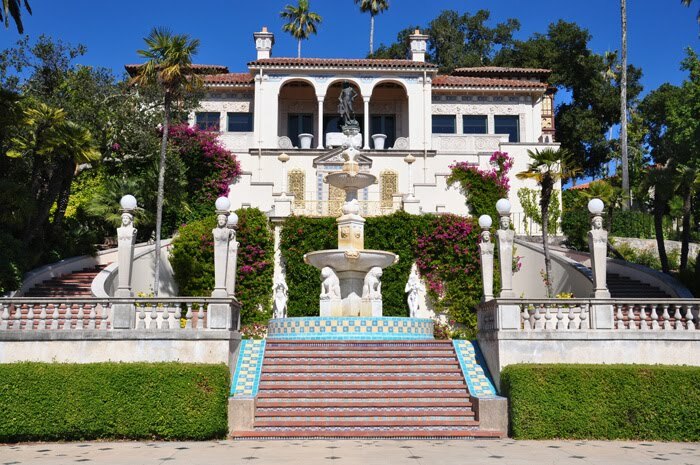 There is a very well done movie in the visitor center which covers Hearst’s life and the influences that lead to his personal attachment to and vision for this estate as well as his close working relationship over several decades with Julia Morgan. Full of quite a few old home movies, it’s just a great chance to learn about their creative working process in addition to the history of the property. This often involved tearing down and rebuilding many aspects of the project as well as designing to complement and feature the amazing, historical pieces of art, furniture and architectural treatments imported from throughout Europe. 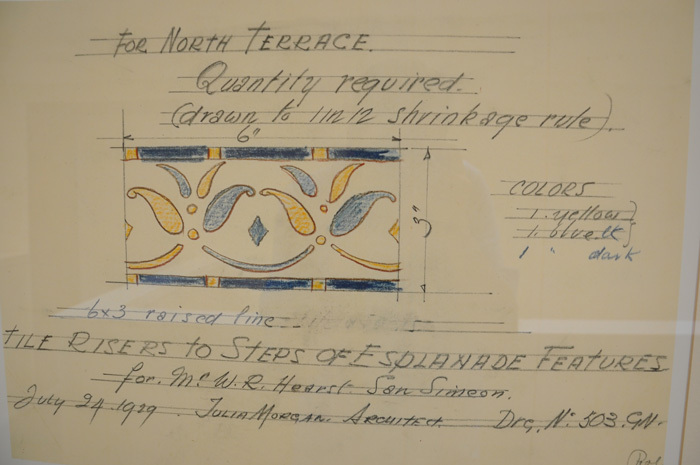 During our overnight we lodged at The Morgan at San Simeon, decorated throughout with an amazing collection of her original architectural design renderings for many aspects of the Castle. Almost all of these were done in graphite and colored pencil. This collection represents a remarkable exhibition of art and has strengthened my own interest in historical architecture and the use of pencil as a creative medium in this trade. I’ve shared a few of my photos of the Morgan drawings here. Amazing details down to the designs of the stair risers all around the property, and untold design features throughout. The bottom of each print includes a description of the item and the inscription “Mr. 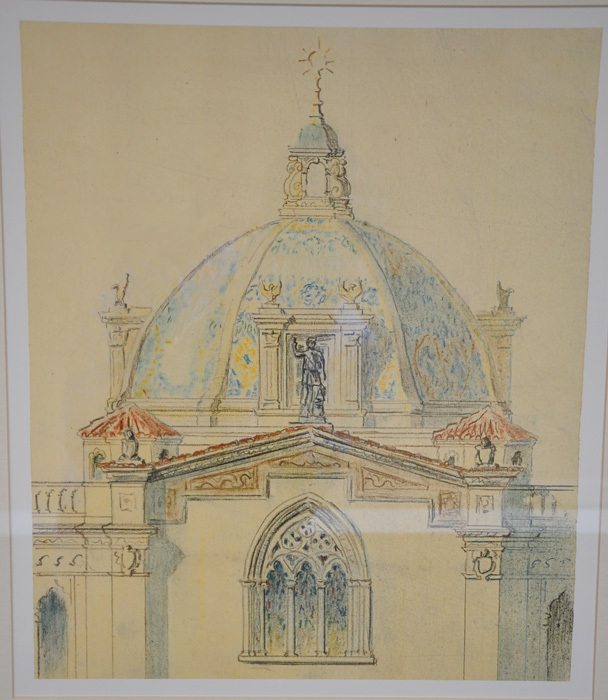 W. R. Hearst San Simeon, Julia Morgan, Architect” along with the date of the drawing, all in pencil. The one photo of the property I included below demonstrates how the tile risers become an integrative component of the overall architectural design. 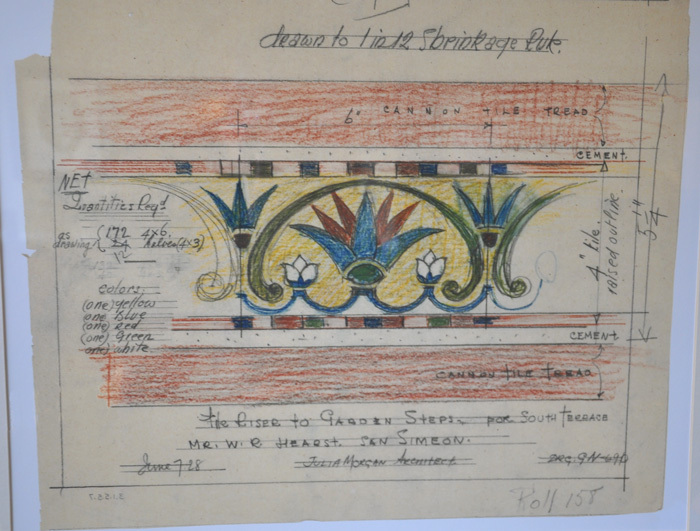 Julia Morgan’s story is a fascinating tale of one of America’s first leading female architects. Graduating in 1894 as Civil Engineering student from University of California, Berkley she was the first woman to be accepted and graduate with a degree in architecture from the Ecole des Beaux-Arts in Paris. Returning to San Francisco and employed by John Galen Howard, who was responsible for the UC Berkeley Campus Master Plan at the time, she worked on designs of several buildings. This included two endowed by Phoebe Apperson Hearst, William Randolph’s mother. This initiated a long relationship between Morgan and the Hearst’s that spanned over 30 years and included multiple projects on both Hearst Estates as well as several newspaper buildings. Beyond her most famous work on Hearst Castle, Morgan was one of several architects contributing to the Bavarian village themed Wyntoon estate on the Hearst’s 67,000 acre forest property along the McCloud River just south of Mt. Shasta. Outside the broad Patronage of the Hearst family, Morgan did extensive work designing buildings for YWCA (including the Asilomar Conference Center) and several other women’s educational institutions such as Mills College. In all something like 700 buildings in California are attributed to her body of work and much has been done by historians documenting her contribution to the field of architecture. One final interesting connection between pencils and this story is that the Hearst’s McCloud River area timberland holdings include stands of California Incense-cedar which have historically been harvested and sold by the Hearst Corporation for use in pencil manufacturing. From 1979 to 2003 our company owned and operated a saw mill at McCloud, CA, which was originally established as the McCloud River Lumber Company in 1896. Even before that we were producing pencil stock lumber in our Mt. Shasta City mill from the early 1960s until the early 1990s. The nearby Hearst lands historically provided some portion of the cedar used by both saw mills to produce pencil stock that was then sent on to our slat operations in Stockton to make pencil slats sold to our pencil manufacturing customers. Even though our manufacturing supply chain is designed much differently today, producing slats in China, we still receive some pencil stock we are purchase from other suppliers who buy cedar logs from the Hearst lands. Thus the Hearst property has been participating in some small portion of the pencil industry’s sustainable cedar supply for 50 years or so.